As one of the more volatile members of the T10 cryptocurrencies, Ethereum is something that mandates special attention for traders that dare to venture into the land of the ‘unknown’. The picture above shows Ethereum on the H2 chart (H2 = 2-Hour Time Chart). 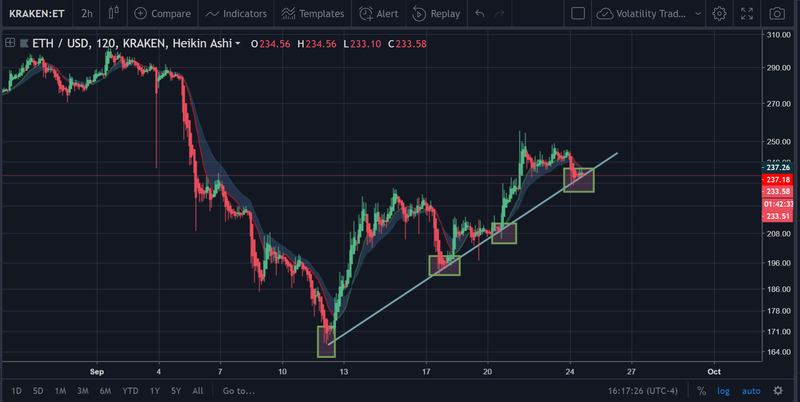 As you can see above, the translucent boxes show that the uptrend line that has formed itself is well tested at this point, with several rises after the re-tests. At this point, after four tests of the line, we can consider this to be a reliable point of support for the price. 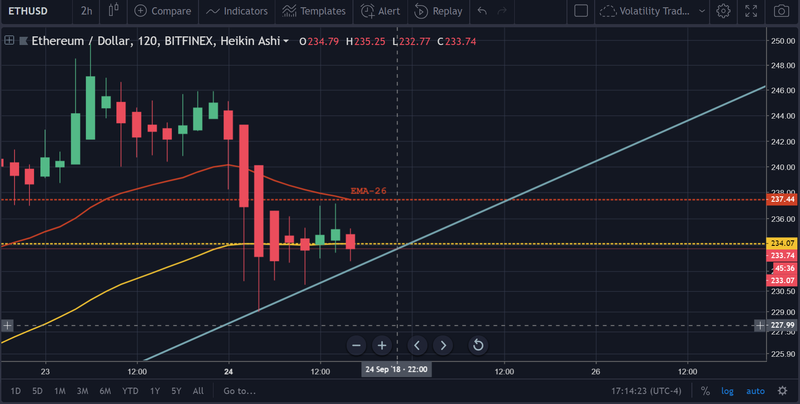 Thus, since the price is currently trading against this line at this point, it is reasonable to expect that there could be a potential price gain in the immediate future (immediate since its the H2 timeframe). The RSI on the H2 time frame shows the RSI speeding toward the oversold point. Normally, in a bear market this would be something that would be of no greater consequence for us. 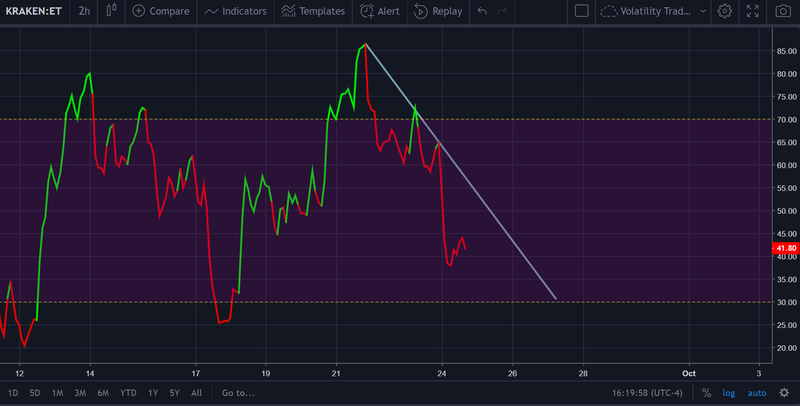 However, since the overall trend on the higher time frames dictates that the positive momentum is still in full swing, this is a condition that we could be justified in seeing as temporary. Above, is a picture of the RSI(14) on the daily chart. 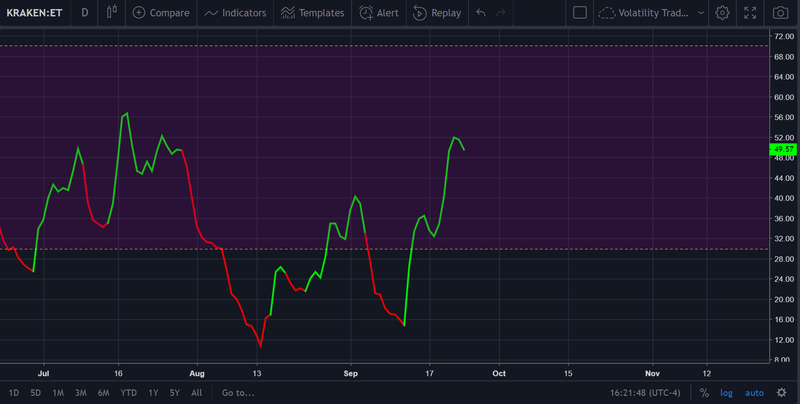 As one can observe in the picture above, the RSI is still increasing at a steady pace with a marked trend. Therefore, the data that we observe on the RSI(14) for the H2, in the author’s opinion, indicates a period of consolidation rather than the beginning of a downtrend. In order to confirm, let’s take a look at a few other indicators. This is a custom indicator that we have yet to use in the bear market, but one that would be useful in this scenario. Gives us a multitude of buy and sell signals. Helps us to anticipate when there may be a potential uptick in the price. Based on what we can see above in the H2 time frame, it appears that an impending uptick in the price could be around the corner. One of the basic principles of EMA indicators is that the closer they become to one another, the more likely it is that they will cross in the near future, which would signal a reversal in the price movement. Currently, that principle is espoused in the indicator above through the narrowing or thinning of the mean reversion ribbon. This is exemplified in the picture above via the translucent green box for those that were not able to identify it earlier. The ribbon itself signals a resistance and support point contingent upon whether the price is above or below. At this point, the price is below the EMA mean reversion, which makes it a point of resistance. As we can see on the chart above, the overhead resistance is hanging at $237. 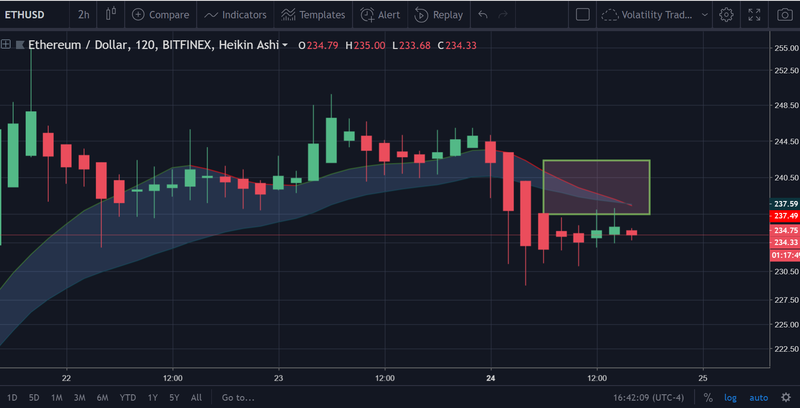 Therefore, as a starter, the price should at least break through $237 before we really begin to become bullish on the price action again in the short-term. The EMA-26 is also hanging at the $237 price mark as well. 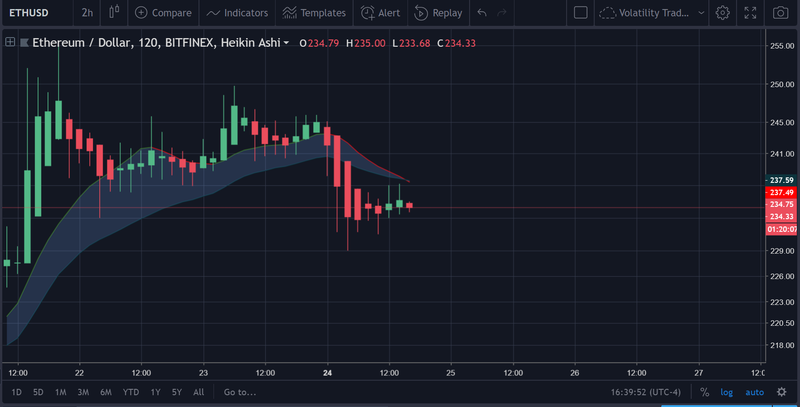 Based on what was shown above as well as in other indicators, there is probably more consolidation that is due on the Ethereum chart. Advocating a long position at this point is not something that can be done definitively at this point if one wanted to maximize their R/R. However, the convergence of the EMA indicators as shown by the EMA mean regression (custom indicator) above yields credence to the idea that there may be a reversal in the price in the near future. 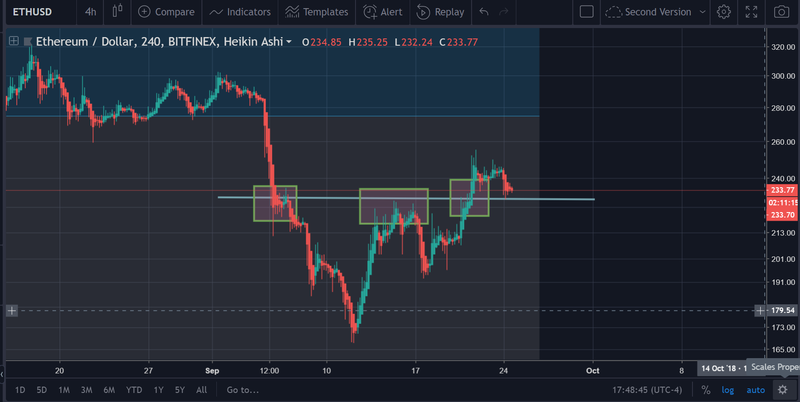 As you can see in the above picture, the price did ascend past the resistance point that it was nudging against (marked by the translucent green triangles). After the price surpassed that point, it then re-tested (the phase that it is in currently). The maximum overhead resistance, according to the Fib levels, is marked at $275.